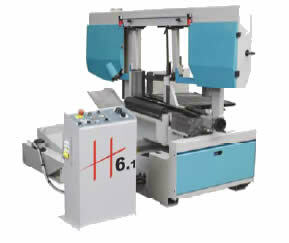 Heavy Duty Miter Cutting Horizontal Bandsaws. This bandsaw is built to handle cutting solids and even structurals with simple prep and fast results. Heavy duty construction for steady operation. Features sensors for material dimensions and automatic cutting. 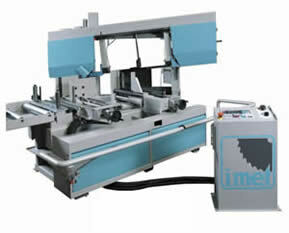 45 Degrees 17 1/2" 17 1/2"
60 Degrees 9 1/2" 9 1/2"
Machine operation is full cycle, semi-automatic. Material size is automatically sensed by the sawframe. Production sawing can be very fast!